While that is a wide scope of people, depending on what your opinion is of what a DREAMer should be entitled to, it may seem too limiting, or too lenient. But to those who fall into this category, the idea of being a chosen DREAMer is a very exciting prospect—it means that those who most likely came here through no choice of their own at an age too young to remember anything but the US as home will have the same rights to education and other benefits as their American-born counterparts. Think of it this way: To be an American citizen, one must simply be born here. But to qualify to be a DREAMer, you must already be more invested in a education that most young inner city American children are, with a dropout rate of more than 50% in many urban and even rural areas. 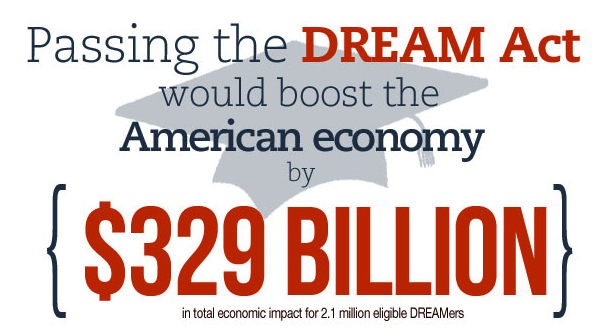 And along with that commitment to education, many DREAMers go on to make enormous contributions to their workplaces, their families, and in the eyes of any person just looking at bottom lines who is more interested in the welfare of the country than of immigrants, the numbers still support this kind of immigration reform, because DREAMers, if allowed to stick around, will contribute nearly $330 Billion USD to the economy. Let the numbers speak for themselves. We need immigrants, and they need the US for their education and a chance at a bright future. Why not create a win-win scenario and stop making this about antiquated ideals that no longer matter?